Fall is an ideal time to plant most trees and many were planted this year. Now it’s our job to give these trees the best start possible by watering them regularly. About three gallons per week will do it. Why do trees need water when it’s been raining? Dig down and take a look. The first few inches of soil may be wet, but did the water get down to the root zone for your new tree? Watering young trees encourages root growth and is essential for giving your young tree a good start. Your thirsty trees will thank you! 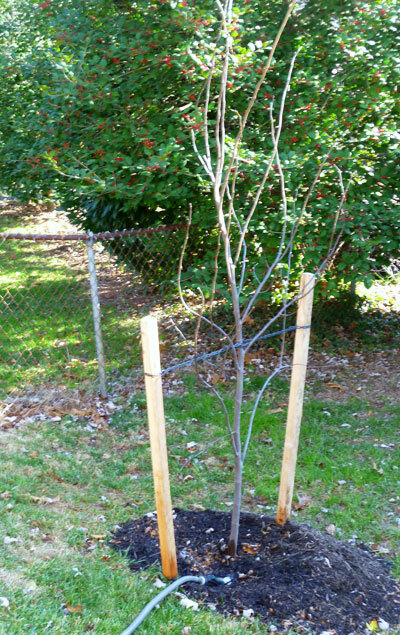 This entry was posted in Tree Care and tagged planting, Tree Canopy Fund, water, watering. Bookmark the permalink.